Well now, that was the fastest 23 km I’ve ever run, so fast I made it back to the store in 1.5 hours, so fast I made it back BEFORE the notorious speedys – forget that I needed a cab to do it in, but whatever. Reason #253 why it’s best not to injure yourself on a run: cabs are bloody expensive! As I’m sure most of you are aware by now, I am so super freaked out of a) getting sick and b) getting injured before Marathon Day. So much so that in the last two weeks, anytime someone has so much as sniffled (which is a lot – I’m like a freaking magnet for the sickies these days!) I instantly start thinking I’ve got the Ebola, and run to the washroom to thoroughly inspect my eyes to make sure no blood is splurting from them. So much so, that I’ve also become quite the klutz in the last week or so. I’ve nearly rolled my ankle at least 10 times, I’ve tripped on the carpet coming out of my condo, tripped going into a washroom with a step up, tripped over my freaking pant leg, and yes fallen down the stairs too. 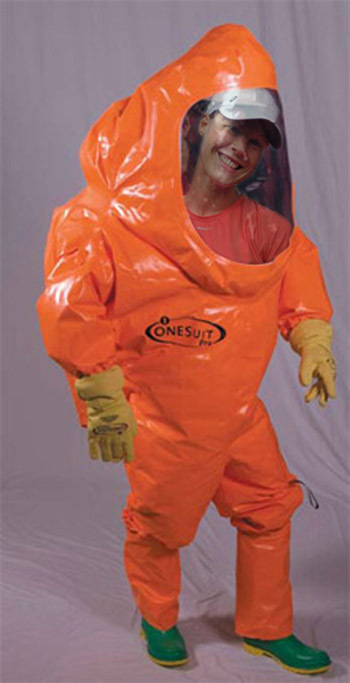 Needless to say, Mario has been researching hazmat suits for me! Not exactly sure this is the most fashion friendly outfit! So yesterday morning, at about 8 km into my 23 km run, when I started to feel a bit of a tweak in the inner part of my knee, I initially just thought it was more head games. I tried mind over matter, tried telling myself it wasn’t there, that it was nothing, but given that the run already hadn’t been the most pleasant for me (I blame the deluge of rain!) mind over matter wasn’t exactly working. I lasted almost 3 more kilometres, which consisted of denying the dull ache, making deals with myself to keep going, and a little bit of berating myself too, before finally making the “smart” decision of calling it quits. I’m now less than two weeks away from Marathon Day, that dull ache could have quickly turned into a take-me-out-of-the-game ache – something I definitely did not want. I sent my girls on, called a cab, and $20 later – YES $20!!! – I was back at the store. You are ready for what lies ahead. Little hiccups happen and they are what build us up. No problem, my friend….no problem. You’ve come leaps and bounds and THAT is something to be so proud of! And, as my clinic leaders pointed out in our last clinic, we’re in taper down mode, there is nothing more we can do to better ourselves for Marathon Day. So if it means I don’t do my last speed training session this week, so be it. And really, am I going to miss it? Probably not. And if it means I rename RICE (Rest. Ice. Compression. Elevation.) to RIAH (Rest. Ice. Advil. Hope for the best) than so be it. I’m in taper down mode baby; it’s just my taper down might be a whole lot more tapered down than others! Here’s to a healthy, ache-free knee on Marathon Day – in 13 days! ice it up and rest. you’ve got plenty of time to get right before the starting line. good luck and have fun!